Keeping your skin clean is the first step to achieving healthy glowing skin. Our Face Washes & Cleansers gently remove makeup, toxins and impurities without the use of harsh chemicals which can strip the skin. We use natures purest ingredients to balance, refresh & replenish your skin. Our products are great for sensitive and allergy prone skin, and we also provide specialised skin remedies for conditions such as Acne, Rosacea, Pigmentation, Eczema and Psoriasis. 20% of PHB's profits go to charity so not only do our products work wonders for your skin but you are helping make a positive impact on peoples lives around the world! Face Wash or Cleanser? 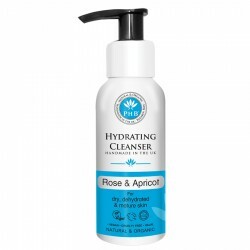 We provided Foaming Gel Face Washes and Deep Cleaning Creamy Cleansers for you to choose from. Both are kind to your skin! For best results we recommend using the creamy cleansers for deep cleaning in the evening - perfect to remove all traces of makeup, toxins and impurities that build up on skin during the day. Then use our foaming face washes in the morning to refresh and revive skin after a good nights sleep!